I’m incredibly lucky to live in a town where there is a locally-sourced market, the Melrose Farmers’ Market. The market always has fruits and vegetables of the season, meats, fish and locally produced foods like breads and baked goods. 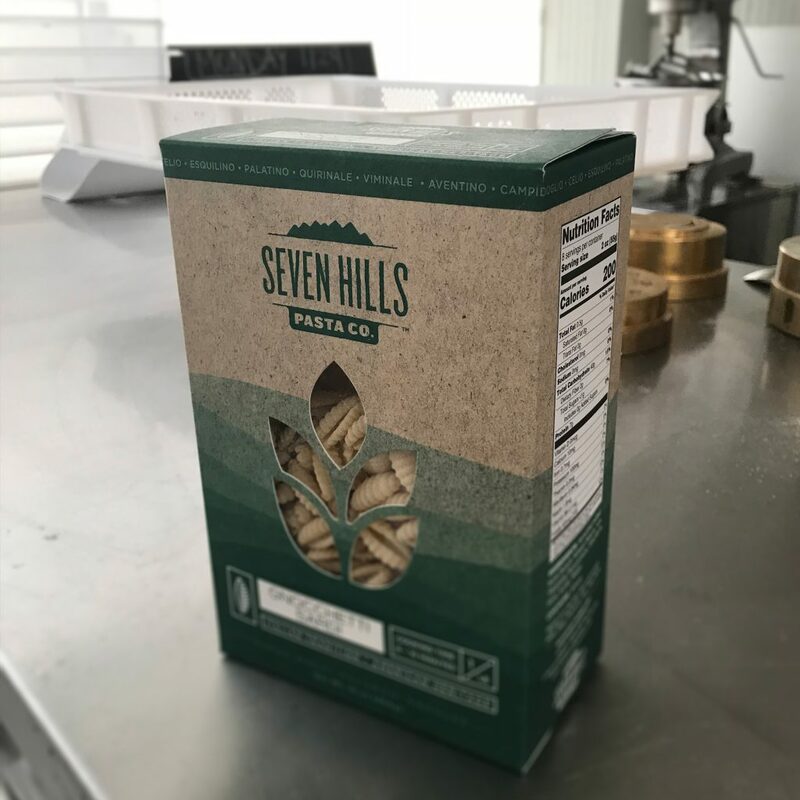 My favorites to pick up are dried pasta and pasta sauce from Seven Hills Pasta. 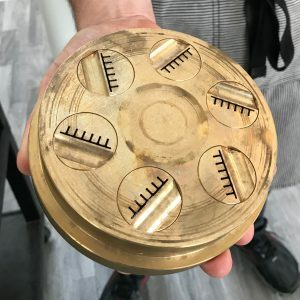 Carol and Giulio Caperchi, the power couple behind behind Seven Hills Pasta, graciously invited me to their pasta kitchen, located in Melrose, to show me where the pasta-making magic happens. On one side, there is a Pama Parsi pasta machine that was hand-welded and made in a town outside of Rome. The pasta shapes are made with just water and Semola di Grano Duro (Hard Durum Wheat) and created with very heavy dies that are hand-casted. Next to it, there is a gigantic temperature-controlled pasta drying container that slowly dries out the pasta over a 24 hour period. The result is a wholesome and chewy pasta with a taste that will transport you to Italy. 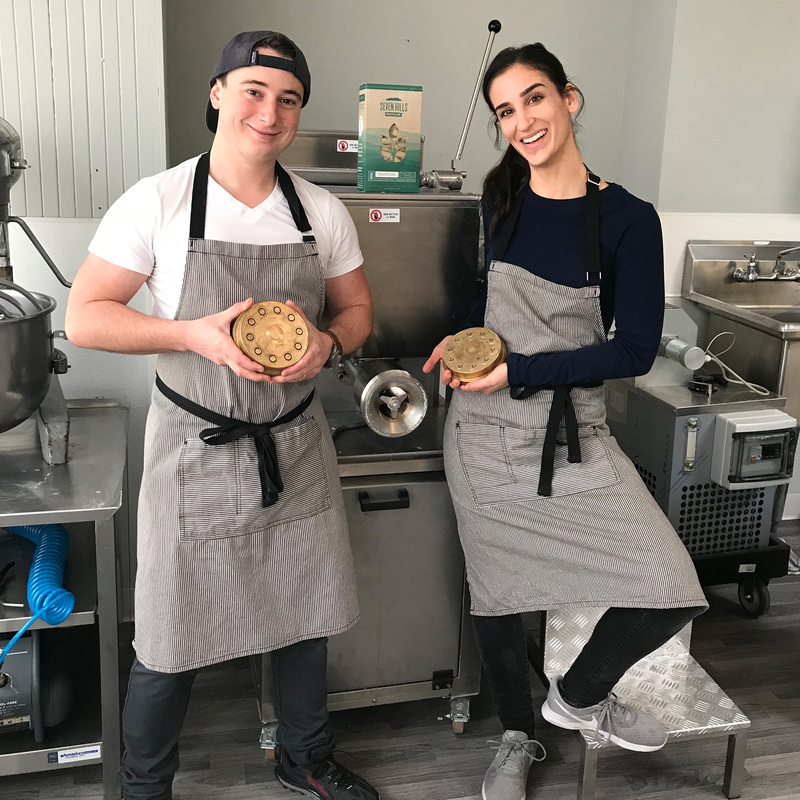 I absolutely love how Carol and Giulio have united their Italian tradition and modernized it with an American heritage and culture to create these delicious pastas. During my visit, they revealed their new packaging for their pastas. It’s beautifully designed with a modern clean look and has a hidden Easter egg of where the name, Seven Hills, comes from. 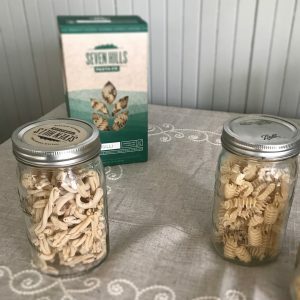 In Seven Hills Pasta’s near future, they will be selling their creations to local stores and will be hosting monthly events in their kitchen space, like pasta-making classes or educational Italian region themed dinners. Below, you’ll find out more about how Carol and Giulio got their start and what inspires them to make their goods. Tell me about yourself and your shop. How did you get started? CC: We’re a small family business (my husband and I) with 1 employee who works at our small farm in Rutland, MA. 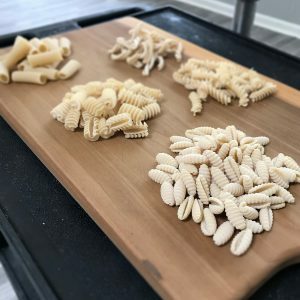 At our pasta kitchen in Melrose, we make small batch dried pasta in a variety of shapes like Rigatoni, Fusilli, Casarecce, Gnocchetti Sardi … the list goes on! We often pair our pasta with a signature sauce that’s typically seasonal – last fall we did a butternut squash pasta sauce that was a hit at the farmers market! We source ingredients for our sauces from our farm as often as we can. We got started with the pasta endeavor about 2 years ago while we were in Italy (my husband, Giulio, is from Rome). We’d been thinking about branching into pasta (initially our business sold Italian Wine Crackers called Taralli) but weren’t sure where to begin. We were able to visit a small pasta machine manufacturer just outside of Rome where ultimately we would purchase our machines from. Our passion for rustic Italian specialties runs deep and we always had a vision to share those recipes and traditions through our business. What is your inspiration behind your goods? CC: We’re inspired by our travels and love of good, simple food. Having food be the way in which you communicate and share your stories / passion / interests is what drives us to create a wholesome, honest, simple, and delicious product. We’re also surrounded by so many diverse and exciting small foods businesses in the Boston area that we feel inspired and proud to be a part of the industry. What is the most unique about where you live? CC: We live in the North End with our 1 year old daughter. Living there you definitely feel a sense of community – an almost small town feel right in the heart of the city, we love it. Of course, with my husband being from Italy, the Italian influence unique to our neighborhood makes it the perfect spot for us to live. What is the top place you have visited? 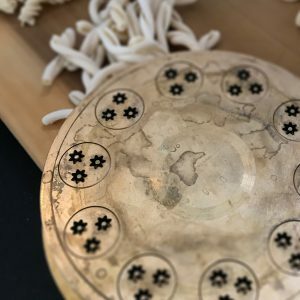 CC: I like to find souvenirs that are unique – I remember purchasing a hand-painted picture frame for my mother from a small city called Orvieto in Italy – it was unique and painted in the traditional style from that region. If we’re on a hike or a walk on the beach I like to collect rocks or shells from wherever we are. CC: I’d love to visit Barcelona, Buenos Aires, Lisbon, Stockholm, Sydney … the list goes on! Top 5 places you have visited? CC: We’re biased to Italian spots: Sicily, Sardinia, Florence …..We absolutely loved the island of Naxos in Greece too… California and of course New York City. Top 5 favorite goods from Boston or your favorite city? Food will dominate this list…. At the moment we’re loving the smoked salmon from Boston Smoked Fish Co. – SO good! We have a small Italian bookstore in the North End called IAMBOOKS and we adore it. We love buying our daughter books from there, it’s a gem! Wolf Meadow Farm’s Mozzarella is a staple in our fridge! Grazie, Carol and Giulio, for having me!